LÚNASA MAKE a welcome return to Galway and the Galway Sessions festival when the trad supergroup play Monroe's Live on Thursday June 18. A hectic and busy international touring schedule has afforded the band little opportunity to play in Ireland in recent times so this Galway gig is all the more to be welcomed. Alongside Sean, the Lunasa line-up is completed by Kevin Crawford (flutes, low whistles, tin whistles ), Trevor Hutchinson (double bass ), Ed Boyd (guitar ) and Cillian Vallely (uilleann pipes, low whistles ). 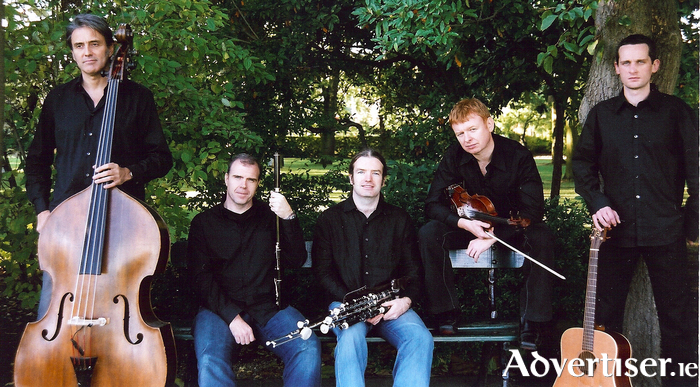 Lúnasa have sold more than quarter of a million albums since forming in 1997. They boast an impressive back catalogue of seven highly acclaimed and award-winning studio albums. The band is internationally acknowledged as being the finest traditional Irish instrumental outfit of recent times. They are renowned for their stunning shows honed by superb musicianship and a constant touring cycle. They have performed more than 1,500 shows across 36 countries, including appearances at The Hollywood Bowl, the National Concert Hall Dublin, the Bath Fok Fwstival, and Sydney Opera House. Their inventive arrangements and bass-driven grooves have steered Irish acoustic music into surprising new territory. Their recordings have been hailed as some of the best and most important world music albums anywhere, while their blend of intelligence, innovation, virtuosity, and passion has brought them to the forefront of Celtic music. The individual group members are in increasing demand across the globe for touring and recording work – Trevor went out on a European tour with his old band mates, The Waterboys; Cillian collaborated with Bruce Springsteen on his 2014 album High Hopes; Kevin toured with Martin Hayes and John Doyle as The Teetotalers; Ed has toured with Flook and Cara Dillon; and Sean transforms back to being medical practitioner Dr Smyth between Lúnasa tours. Doctoring, in fact, prevented Sean from joining his bandmates on their recent series of gigs with the wonderful Mary Chapin Carpenter. The good doctor is relishing the opportunity of taking out his fiddle and playing for a Galway audience again. “Our very first album came from a concert in Le Graal in Dominick Street back in the 1990s," he says. "We had an apartment upstairs from there and had recording equipment so we put on the gig and recorded it and that was the start of the Lunasa story. It’s always great to get back to Galway, we have lots of friends here and people who encouraged us over the years so this gig is basically a stone’s throw from where we started. Tickets for Lúnasa are available from www.monroes.ie for €15 and on the door for €17.50.